All photos by Paula de la Cruz. 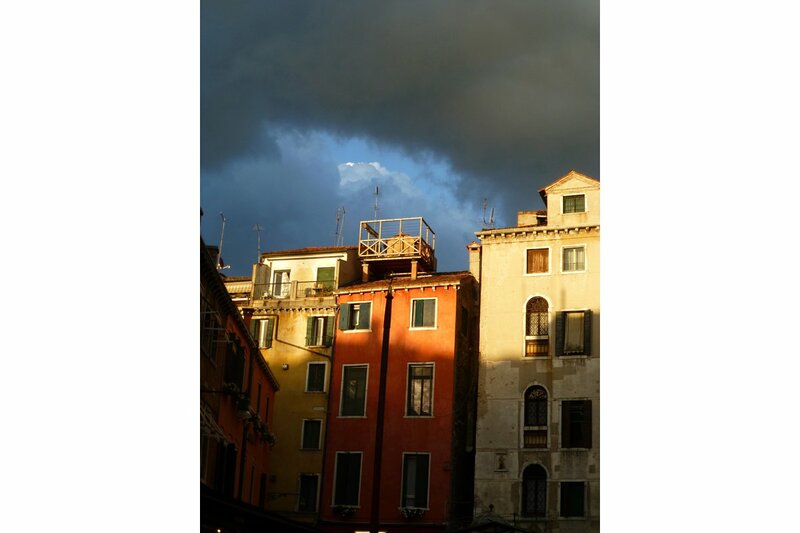 VENICE – Are you planning a trip to Venice before November? Why not? The Biennale is on, the art is fantastic, and the city is electrifying. A first-timer takes us on a tour. Part of the fun of the Venice Biennale is people watching. Especially their outfits. 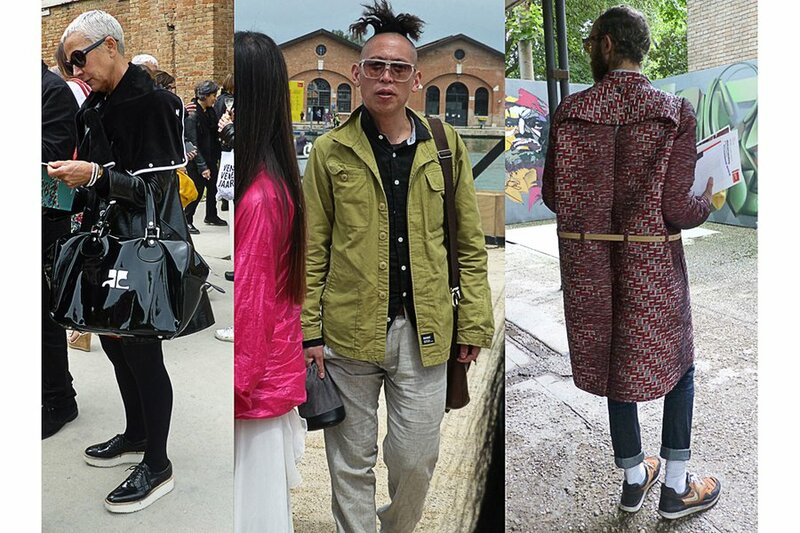 This year's main themes were silk-tie fabric coats, monochrome from head to toe, strange hair, and big splashy purses. The preferred shoes were Nike with fluorescent details. As expected, the collectors were all about big brands,while the artists or wannabes seemed to go for the vintage layered look. By 2009, François Pinault put Venice permanently on the contemporary art map when he finished transforming Punta della Dogana and Palazzo Grassi into art galleries to showcase (mainly) his art collection. 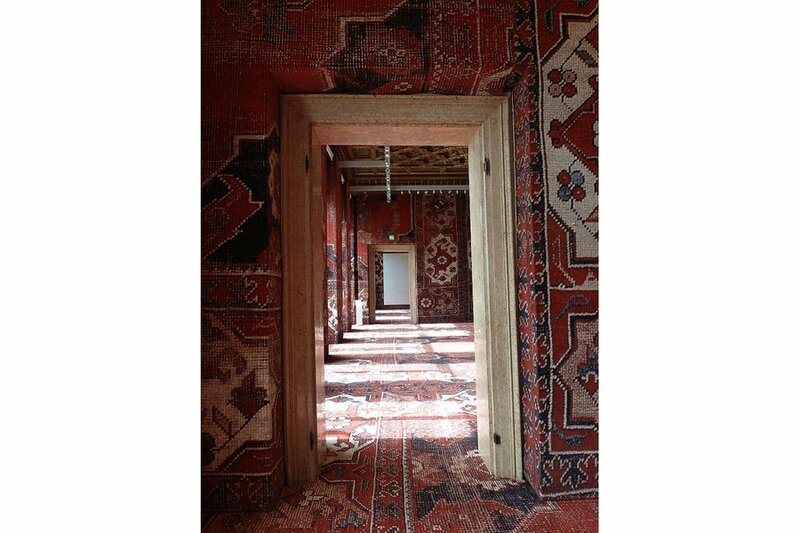 Since April, the whole Palazzo Grassi has been dedicated to an installation by Rudolf Stingel that consists of empty rooms covered entirely by a carpet with oriental motifs. The carpets act as background to his 30 monochromatic paintings. 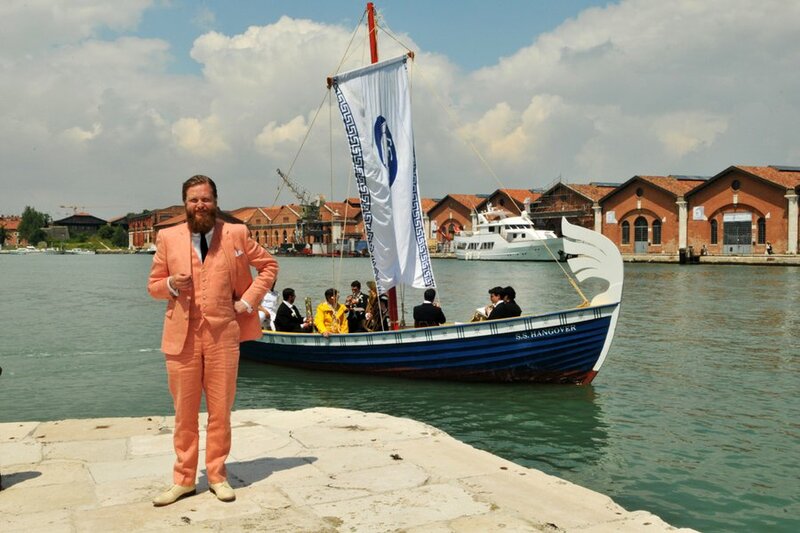 To honor the Venetian golden age, when the city's shipyards were still producing boats, artist Ragnar Kjartansson sailed a boat around the Arsenale as a band on board played a soulful piece by former Sigur Rós keyboardist Kjartan Svenisson. The ballad was so heartfelt that whenever the SS Hangover passed, as the ship was called, all cell phones went off and people just stood listening. Right before sunset, the palazzi across from Rialto Mercato seem to levitate: their façades are still illuminated by the sun but the canal is already dark. At this hour, on the shady esplanade of the market, you'll see Venetians in their natural habitat, always standing, making lively conversation while whirling an Aperol spritz. The bright orange drink matches the Venetian sunset to perfection, and this is the daily social appointment that nobody misses. Naranzaria and Bancogiro are the two preferred bars and restaurants at Rialto market. Bancogiro serves better food, contemporary interpretations of Venetian classics. Iceland's pavilion was at Palazzo Zenobio. 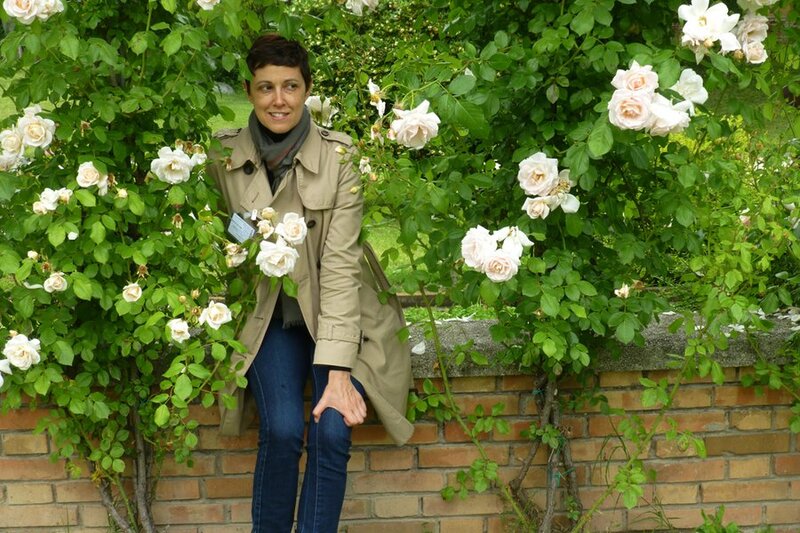 I couldn't resist posing among showers of climbing roses. 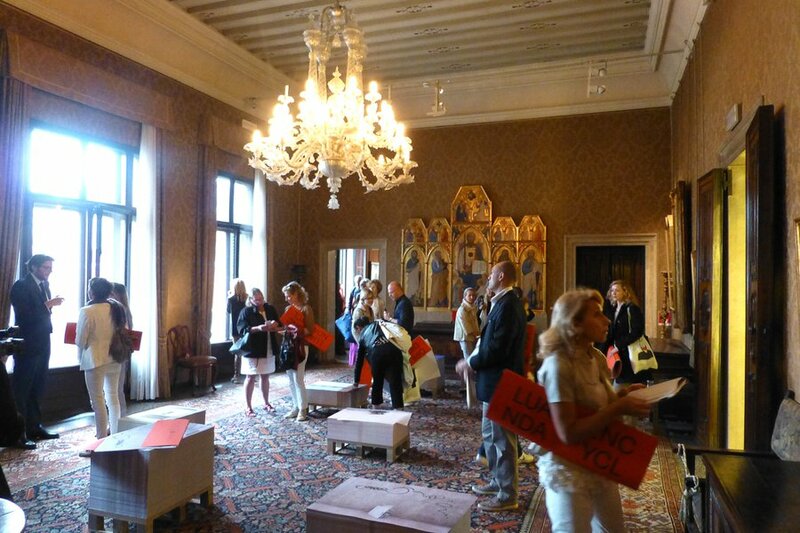 During the Biennale, many of the palatial homes that are normally closed are rented to host a country or a group of artists. The pavilion of Angola, which won the Gold Lion for Best National Participation this year was at the Palazzo Cini, which houses Boticelli, della Francesca, and Lippi paintings and has a room filled with 18th-century Venetian porcelain. The walls covered in red silk give the modern prints by Edson Chagas an intimate feeling that otherwise would have been lost in a modern or larger space. The best opening parties turned out to be the least cool ones this year, mostly hosted in off-the-beaten-path palazzi with live bands and great food. Why wrestle through a queue for a weak mojito just to be with the in Cuban crowd? Or see and be seen at the über chic Bahamas party at Hotel Bauer? No matter where I went, not a single party lacked people worth talking to. But if the company does get stale, the grana padano and the ice cream never will. 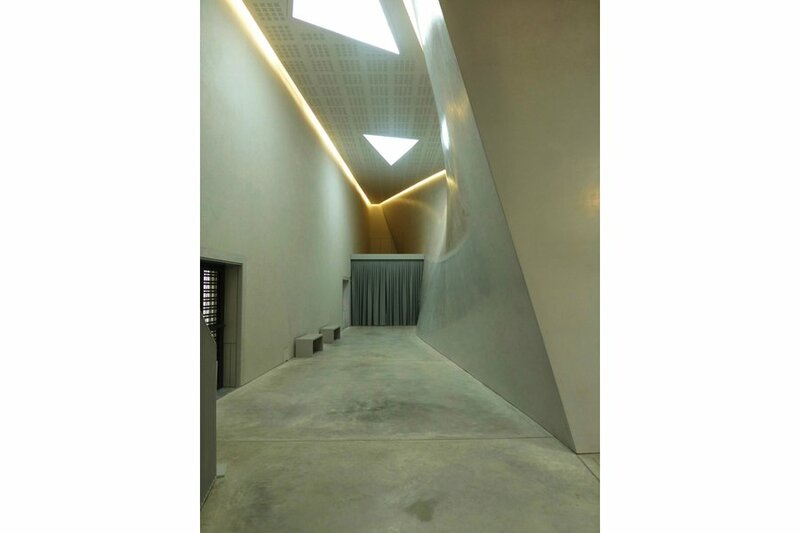 In comparison to Palazzo Grassi, the Teatrino next door to it is an ode to neutrality, receding quietly to the background when films and performances are featured. Until July 14, the Teatrino will be screening short films from the Pinault collection, and from July until September 7, there will be baroque music concerts. If the Venetian-Byzantine architecture is weighing you down, there are two minimalist interiors where you can rest your eyes from marble-mosaic overload. 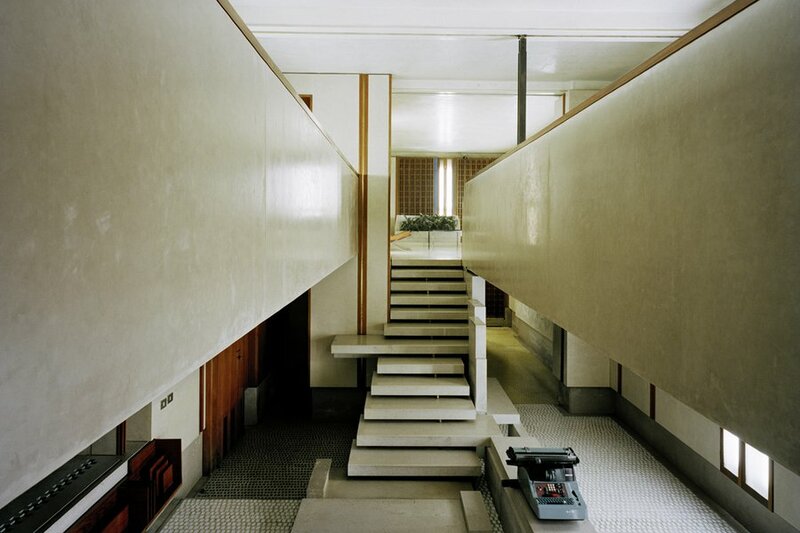 Carlo Scarpa, who was greatly influenced by Japanese architecture and Venetian materials, designed the sparse Negozio Olivetti on Piazza San Marco in 1958. Today it's a museum of sorts for mammoth typewriters, built entirely in Aurisina marble and accessorized with unadorned rosewood shelves and doors. From the second floor, there is a view of the piazza, and the contrast between chaos and order is a welcomed surprise. Venice is called a città morta by Venetians, a “dead city” with an exuberant history and an economy dating back centuries, but now abandoned by the young who look for work elsewhere. The Biennale infuses the city with all kinds of new cultural and artistic experiences and the opportunity to meet creative people from all over the world. Not taking advantage of this once-every-two-years opportunity would be a shame. And all you need is chutzpah and inventive thinking. After all, Venice was built on that. When walking into the Latvian pavilion, you'd never expect to find a giant, leafless tree swinging upside down from the ceiling, installed by Kaspars Podnieks. The walls are filled videos and stills by Krišs Salmanis of people levitating, created using a crane the artist hid behind his subjects. Both installations are references to the traditional Latvian rural lifestyle which exists beyond the geopolitical borders. The bare tree and the photos shot in winter capture the harsh economic and labor Latvian conditions, as well as the exploitation of their natural resources. Somehow the effect is strangely soothing, and even hopeful. One of the surprises at this year's Biennale was seeing a wide range Latin American artists moving beyond political agendas. 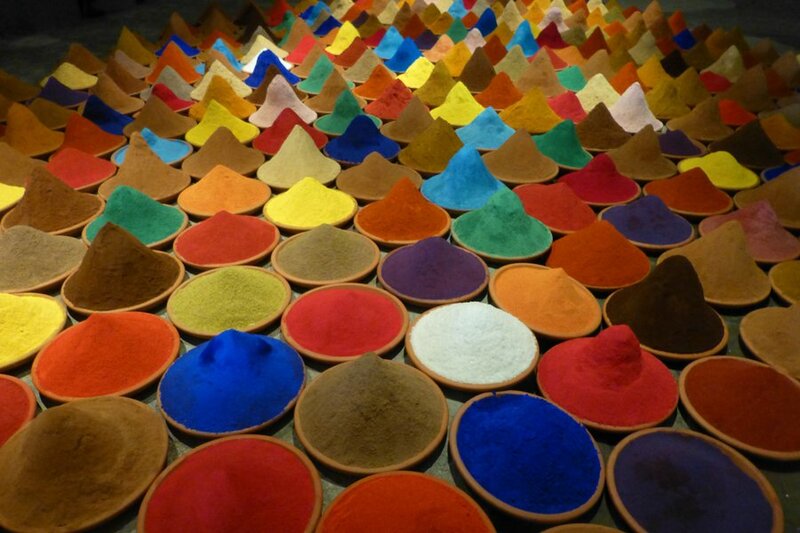 The IILA (Istituto Italo-Latino Americano) pavilion welcomed guests with Guatemalan-and-Bazilian-grown Illy espresso, while the colorful mounds of dyed spices installed on the floor by Sonia Falcone (Bolivia) drew you in and brightened up the otherwise cloudy spring days. Once inside, you could sit on a swing by Humberto Diaz (Cuba), then follow the rope that sustained it for 150 meters. Or watch the video of a man boxing a video of himself boxing, by Jhafis Quintero (Panama). Guillermo Srodek-Hart (Argentina) explored the old bodegas and craftsmen's studios on the outskirts of Buenos Aires in beautifully pensive photographs. The pavilion is a great collaboration that appeals to all senses. Don't even dare asking a gondolier for directions if you are not planning to hire him for a ride. They mean business, always. Except when they are seriously taking a break and catching up with the news. 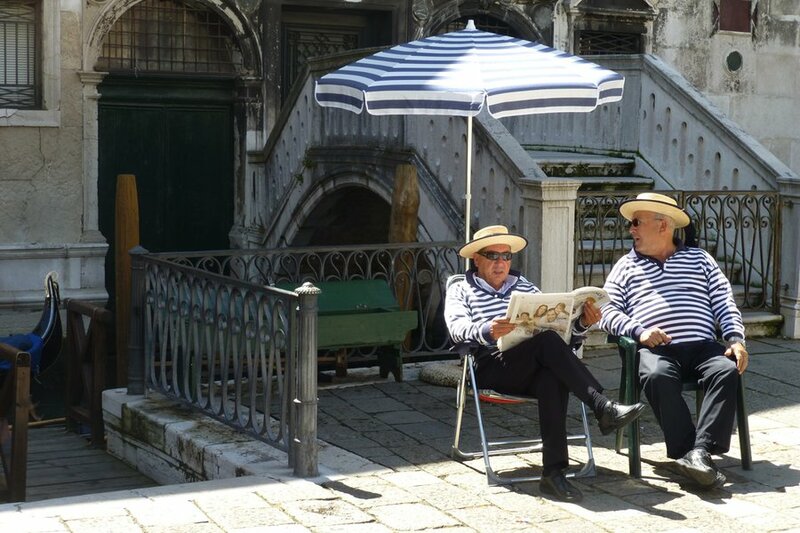 A less touristy option for mingling with gondoliers is to take a traghetto, the semi-public gondolas that take passengers from one side of the canal to the other, and try to understand their local Venetian dialect. I'm usually not one to go out for drinks with priests. But during my visit to one of the many openings around town, I met Don Gianmatteo Caputo, the curator of all 220 churches around Venice. 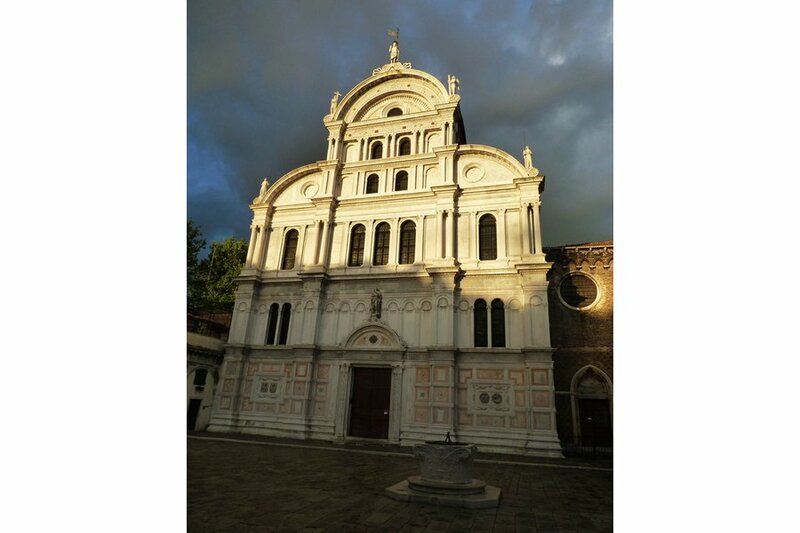 I asked him which church was his favorite, and after much hesitation he replied, "well, San Zaccaria is beautiful, but for the perfect example of Renaissance architecture I like Santa Maria dei Miracoli." Don Caputo is also an architect, so I took his word for it and visited both. While Santa Maria dei Miracoli is called "the marble church" for the massive slabs that cover its walls and its colored marble trims, San Zaccaria's walls are entirely painted by Tintoretto and Tiepolo, among other masters of the Venetian school. The crypt of San Zaccaria often gets flooded during acqua alta and is a must-see part of the church. I can't think of a better place than either of these churches to escape crowds, rain, or to get closer to God. 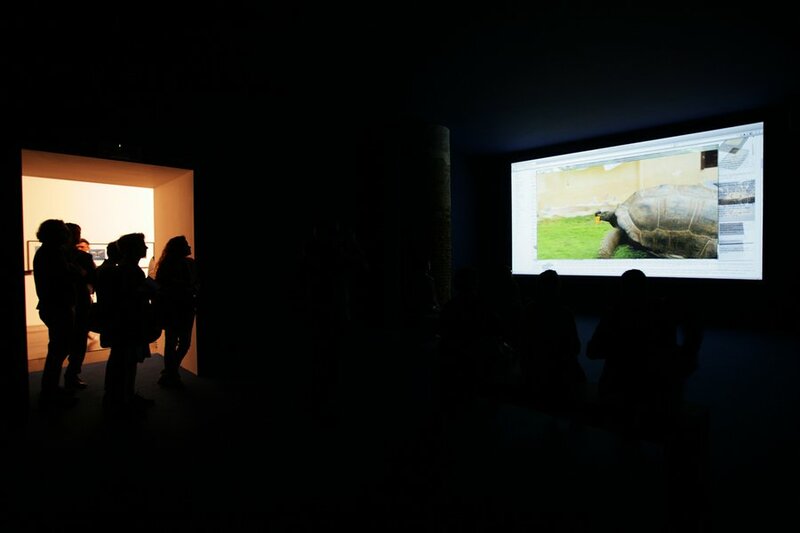 During research for her Grosse Fatigue video installation about the history of the universe, Camille Henrot found many myths describing how it was created. She then used phrases that interested her from each and played on their contradictions. The title of the piece comes from Henrot's time working at the Smithsonian, in Washington D.C., the largest database in the world, and the "visual fatigue" she experienced from looking at endless data and specimens — as well as the fatigue we experience after creation. Henrot then joined poet Jakob Bomberg and created a sort of rap that runs along an infinite series of videos that open on a computer screen. Some videos and photos are of embalmed birds stored in state-of-the-art archives at the zoology libraries of the Smithsonian. The visual effect is serious and a bit eerie, symbolizing the information overload we drown ourselves in. Henrot's brilliant meditation not just on creation, but also extinction, won her the Silver Lion for Best Young Artist at this year's Biennale. Cicchetti, or Venetian tapas, are the soul of social food. 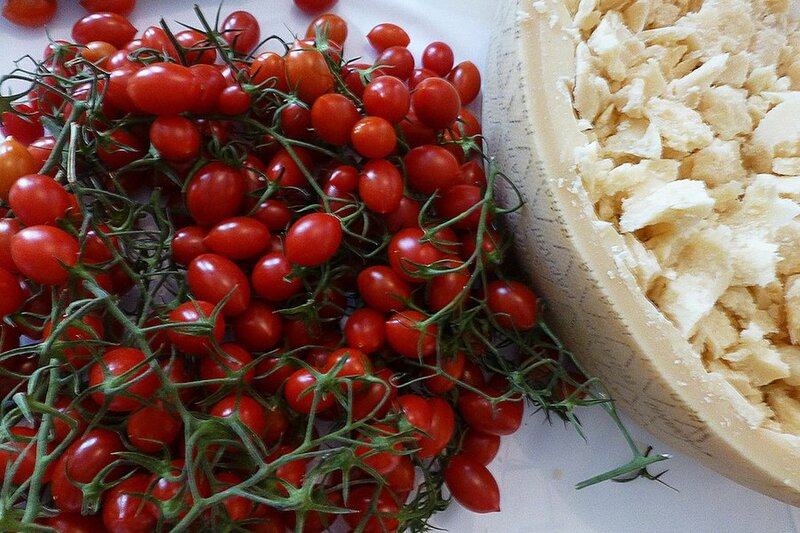 Baccalà mantecato with polenta quickly became my favorite culinary obsession. This dish is the perfect combination of pungent flavors from the sea, tempered by the neutral taste of cornmeal. Salted cod is soaked and whipped into a fluffy cream with garlic-infused olive oil. It's always served room temperature with warm white or yellow polenta. Sardines are served in countless ways in Venice and are the staple of seafood chicchetti. 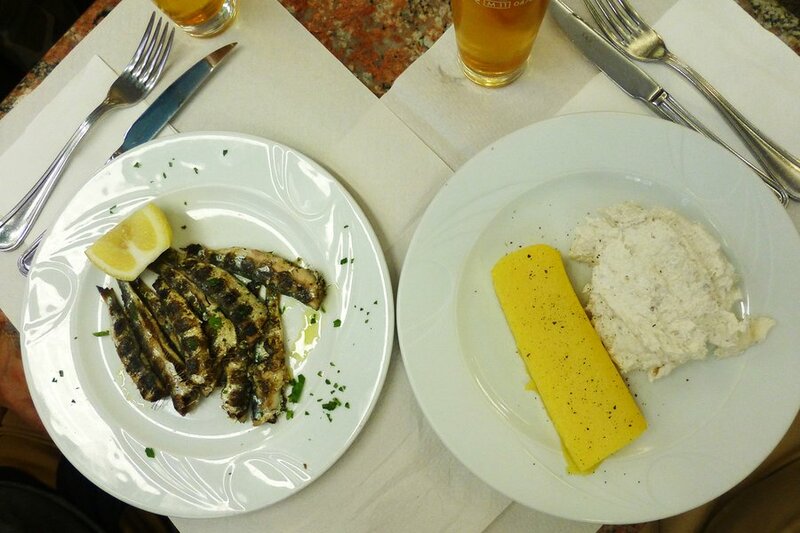 None are more classic than sarde in saor, sardines with sweet and sour onions, and grilled sardines — pictured above at Rosticceria Gislon (Calle de la Bissa 5424; +39-041-522-3569) — washed down with Birra Venezia. All'Arco (San Polo 436, +39-041-520-5666) is also an excellent choice for cicchetti. 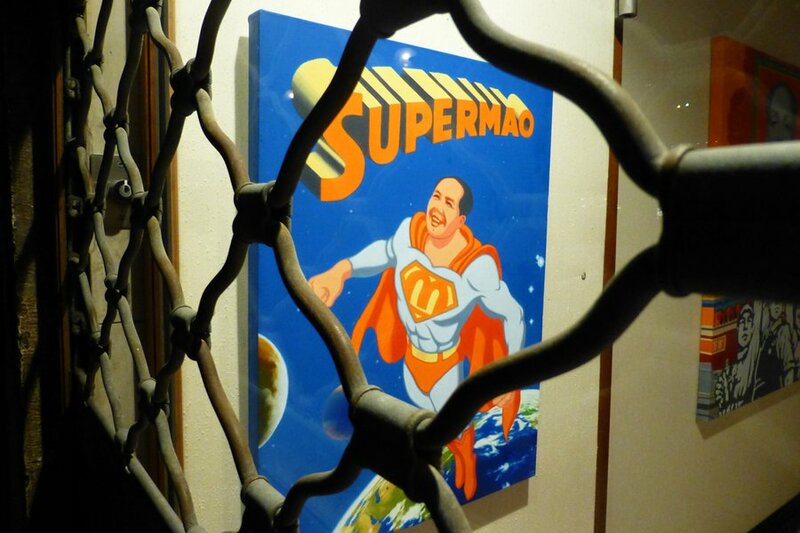 The Chinese presence at this year's Biennale is incredibly strong, not just taking over the German pavilion but also Kenya's, with many Chinese artists showing in off-site locations, like Xu de Qi's paintings of Mao in "Supermao" costume in Piazza San Marco. Germany swapped pavilions with France in the Giardini Biennale. It was an odd move meant to express the countries’ friendly relationship. Even odder was when Germany chose Chinese artist Ai Weiwei to construct the pavilion's feature installation, as if to express Germany's own ship had sailed… and China had become the new world power? 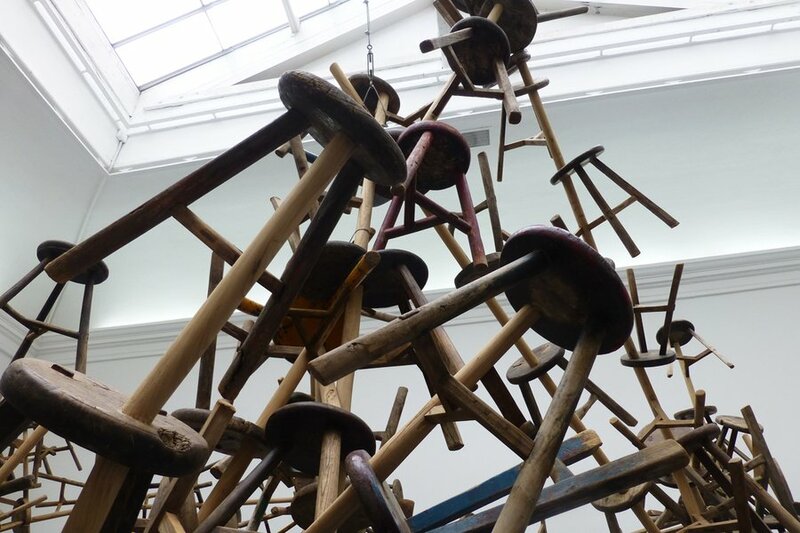 Nonetheless, the massive jungle gym made from 866 three-legged stools — a piece of furniture often passed down from one Chinese generation to the next — is an interesting exploration into the massive growth of contemporary metropolises. 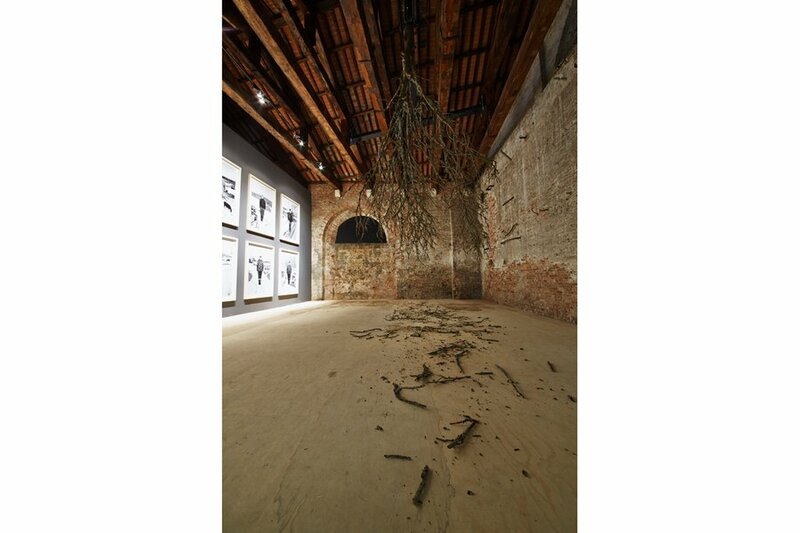 The Venice Biennale kicked off a few weeks ago and will last until November 24, 2013. Paula de la Cruz reports from the Grand Canal. 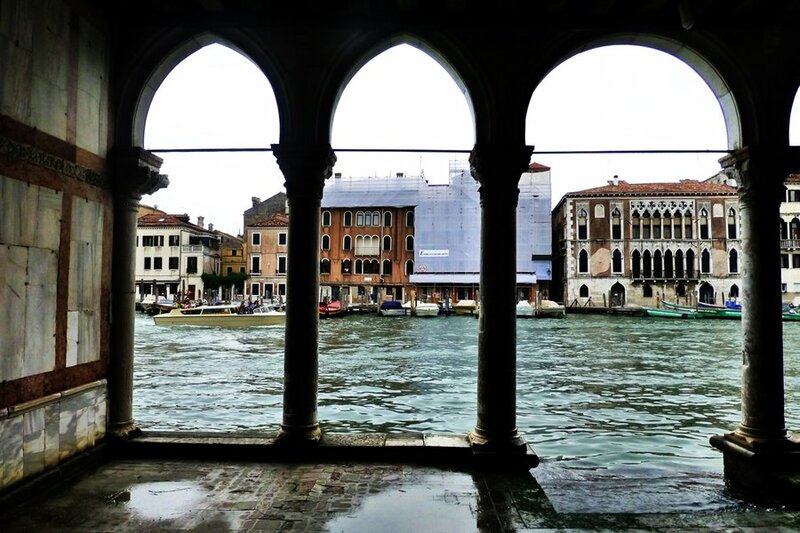 VENICE – This was my first time at the Venice Biennale, the every-two-year artapalooza on the water. It was intense and amazing. But you have to pace yourself to let it all in. And you need time off to replay it in your mind. 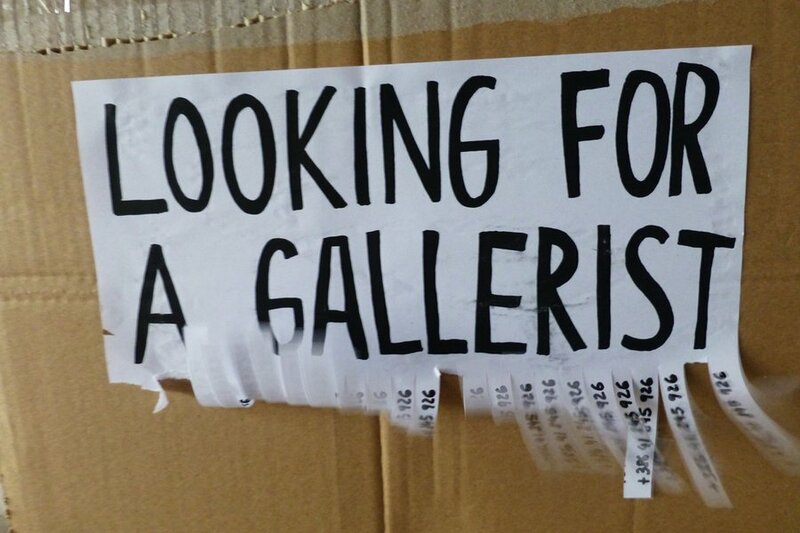 The variety, depth, and quantity of really great art at this year's Biennale is staggering. And the best of it doesn't really come from well known artists but rather from young and sometimes self-taught ones. The city's finest moment may have passed centuries ago, but the Biennale, which debuted in 1895, is now filling la Serenissima with installations, paintings, videos, photos and sculptures that present new perspectives. 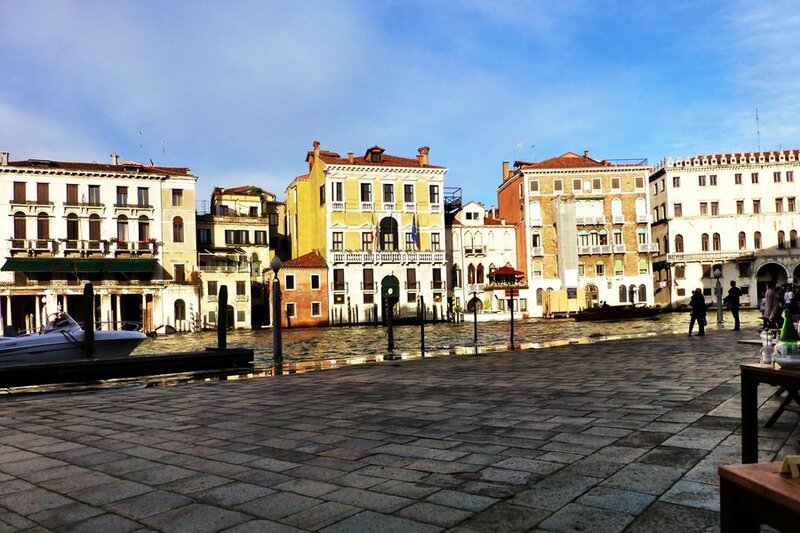 In 2013, Venice is the city to visit. So search for an apartment or book a room in a musty palazzo, and be prepared to be wowed.